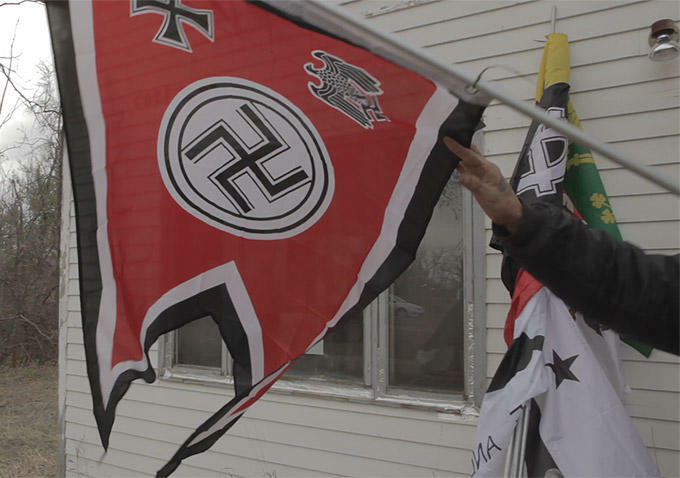 The idea of white supremacists attempting to take over a town seems like it would be fiction, but it’s all too real to the people of Leith, North Dakota. 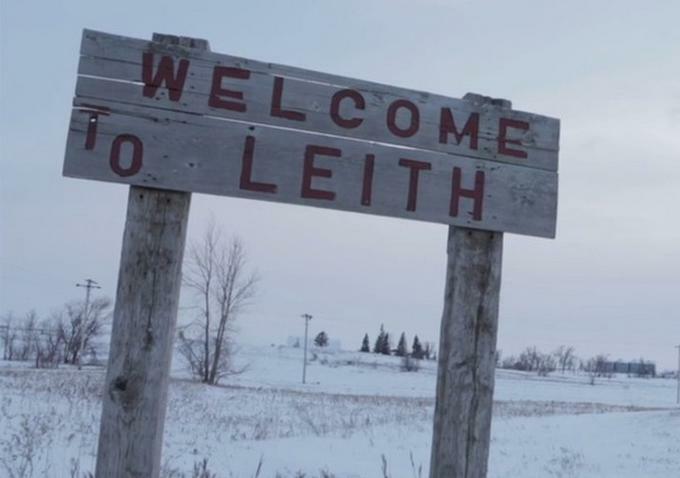 Welcome to Leith is an unnerving documentary, directed by Michael Beach Nichols and Christopher K. Walker. 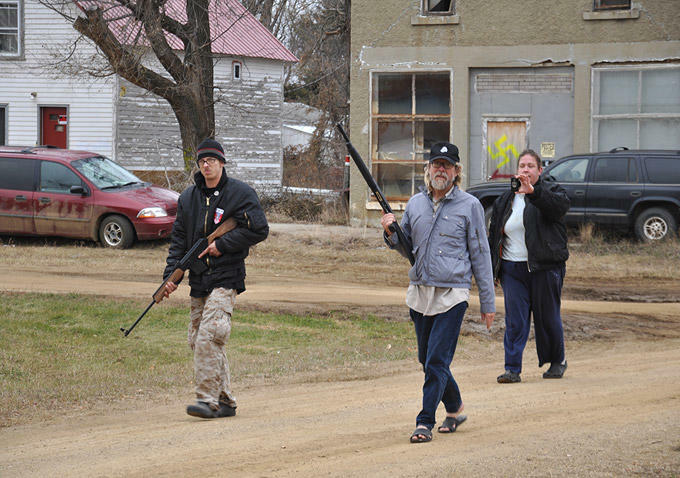 It follows Craig Cobb, a well-known white supremacist, as he moves to the tiny town of Leith, population 24. His intentions, although unknown at the outset, seem to envelope the townspeople both literally and figuratively. Over a period of eight months, Cobb buys plots of land intending to attract leaders in the supremacist movement to join him in Leith and reign supreme. His actions go widely unnoticed until folks from the Southern Poverty Law Center take note and let Cobb’s neighbors in on the scheme. In actuality, only one of his brethren, Kynan Dutton (along with his wife and their children), move to Leith and end up living in a portable unit behind his house. Together Cobb and Dutton set up shop, preparing for a life in Leith where white is right and no one can tell them no. The plots that Cobb purchased are deeded to white supremacists who are extremely high up in the movement, and from time to time, they make appearances at town hall meetings or during protests, as if to say, don’t mess with our representation or this is what’s in store. The land around Cobb’s home is decorated with a large display of Nazi flags and propaganda that they have painted or nailed onto trees. So I know you’re thinking right about now, “can two extremists really stage a takeover?” Perhaps not. But that doesn’t stop them from trying and it certainly doesn’t mean you’d want them as neighbors. The townspeople are so unsettled, so threatened, and most importantly, offended by Cobb’s presence, that they refuse to let things lie. You have to give credit to the people of Leith for not lying down and taking it. The situation eventually reaches a boiling point. The townspeople are angry and scared and Cobb and Dutton are roaming the roads with weapons. This is where you see just how absurd “these people” are. And by these people, I mean Cobb and Dutton. One thing that made me angry wasn’t that Nazi’s still existed (I’m Jewish), or even the hate that they spewed… it was that they thought they were the victims. The irony that is depicted in this film is an incredible look at their belief system and why no progress will ever be made, because they aren’t rational people. This film covers a really tense situation with a really calm lens. It’s admirable that the filmmakers were able to shoot this without taking a hard stance. They also incorporate footage from others, and some of that footage is pretty informative. It’s an interesting look at a miniscule subsection of America dealing with a large-scale issue. I can only hope that the rest of us would deal with the situation in such a calm and classy manner. Go see this film, if only to remind yourself that these people do still exist, and if ever your paths should cross, you can think of the people of Leith. This entry was posted on Tuesday, April 14th, 2015 at 11:54 pm	and is filed under Film, News. You can follow any responses to this entry through the RSS 2.0 feed. You can skip to the end and leave a response. Pinging is currently not allowed. « Film Review: ‘The Wolfpack’!! Mr. Roboto is lying to us. I open-mouth kissed a horse once. That's something you don't know.